The Bureau of Labor Statistics, part of the United States Department of Labor, makes monthly employment and unemployment statistics available. I’ve gathered them for all metropolitan areas and present them in an interactive visualization. This data comes from the BLS Local Area Unemployment Statistics (LAUS) program. 1 It is part of the Bureau’s Current Population Survey (CPS), which is a “monthly survey of households conducted by the Bureau of Census for the Bureau of Labor Statistics.” 2 This data is seasonally adjusted. The civilian labor force and unemployment data are based on the same concepts and definitions as those used for the official national estimates obtained from the Current Population Survey (CPS), a sample survey of households that is conducted for the Bureau of Labor Statistics (BLS) by the U.S. Census Bureau. The LAUS program measures employed persons and unemployed persons on a place-of-residence basis. The universe for each is the civilian noninstitutional population 16 years of age and older. Civilian labor force. Included are all persons in the civilian noninstitutional population ages 16 and older classified as either employed or unemployed. Employed persons are those who did any work at all for pay or profit in the reference week (typically the week including the 12th of the month) or worked 15 hours or more without pay in a family business or farm, plus those not working who had a job from which they were temporarily absent, whether or not paid, for such reasons as labor-management dispute, illness, or vacation. Unemployed persons are those who were not employed during the reference week (based on the definition above), had actively looked for a job sometime in the 4-week period ending with the reference week, and were currently available for work; persons on layoff expecting recall need not be looking for work to be counted as unemployed. The civilian labor force is the sum of employed and unemployed persons. The unemployment rate is the number of unemployed as a percent of the civilian labor force. Both surveys are needed for a complete picture of the labor market. The payroll survey (CES) is designed to measure employment, hours, and earnings in the nonfarm sector, with industry and geographic detail. The survey is best known for providing a highly reliable gauge of monthly change in nonfarm payroll employment. A representative sample of businesses in the U.S. provides the data for the payroll survey. In the visualization you may select tabs to show a table or one of several charts. You may select a range of dates and the metro areas that appear. Click on color legends to highlight a series. USe Ctrl+Click to add additional series. 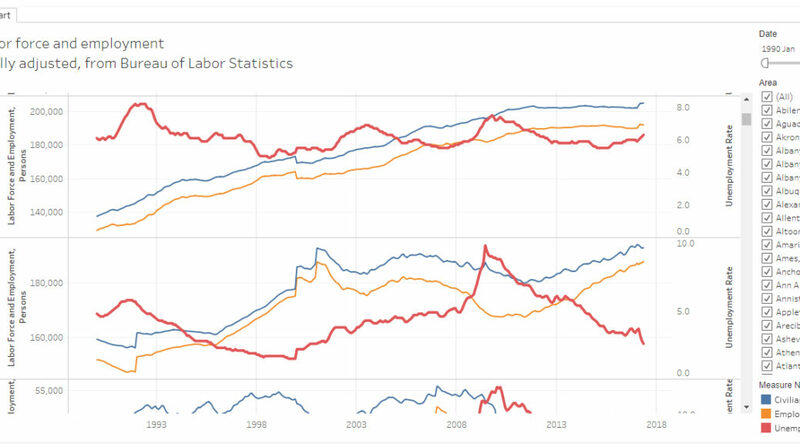 To use the visualization, click on Civilian labor force and unemployment by metropolitan area.